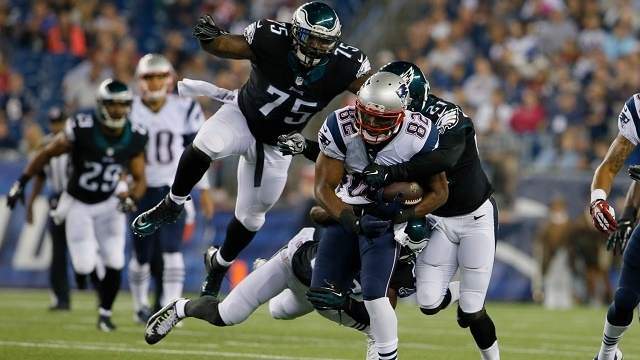 On February 4th, the New England Patriots will face the Philadelphia Eagles for the second time since 2005. After 13 seasons of missing the superbowl, the victory over the Vikings will go down as one of the greatest wins in franchise history. Now they the Eagles are in the Super Bowl, here are some reasons why the Eagles will beat the Patriots in the Superbowl. Having one of the best defensive lines in the league, the Eagles will be able to pressure Tom Brady with their 4 man rush. WIth defensive tackle Fletcher Cox and defensive end Brandon Graham, no team thus far has been able to silence the Eagle’s defensive line. After suffering from a concussion on Sunday, Gronkowski is still questioned if he is able to play or not. If Gronkowski is out on Super Bowl Sunday, the Patriots will be at a major disadvantage. Rob Gronkowski is by far one of the Patriot’s most effective offensive weapon, setting the record for the Tight ENd position with 1,327 yards and 17 touchdowns. IN addition, Gronkowski’s potential absence could make things easier for the Eagle’s defensive line to neutralize the Patriot’s offense. Thought Tom Brady is known as the “king of comebacks”, it is not a good sign that the Patriots had to battle a 17-3 lead against a team like the Jaguars. Having the home- court advantage, a team like the Patriots should have blown out the Jaguars. If the Jaguars are able to sustain a large lead throughout the 2nd half, the Patriots will have to pull off a miraculous finish in order to beat the Eagles.